For the town in Australia, see El Arish, Queensland. For the village in Iran, see Arish, Iran. Arish or el Arīsh (Arabic: العريش‎ al-ʿArīš Egyptian Arabic pronunciation: [elʕæˈɾiːʃ], Coptic: ϩⲣⲓⲛⲟⲕⲟⲣⲟⲩⲣⲁ Hrinokorura) is the capital and largest city (with 164,830 inhabitants as of 2012[update]) of the Egyptian governorate of North Sinai, as well as the largest city on the entire Sinai Peninsula, lying on the Mediterranean coast of the Sinai peninsula, 344 kilometers (214 mi) northeast of Cairo. It borders the Gaza Strip and Israel. Arish is distinguished by its clear blue water, widespread fruitful palmy wood on its coast, and its soft white sand. It has a marina, and many luxury hotels. The city also has some of the faculties of Suez Canal University. Arish is by a big wadi, the Wadi Al Arish, which receives flash flood water from much of north and central Sinai. The Azzaraniq national park is on the eastern side of Arish. El Arish airfield, World War II. The city grew around a Bedouin settlement near the ancient Ptolemaic outpost of Rhinocorura. In the Middle Ages, pilgrims misidentified the site as the Sukkot of the Bible. ʻArīsh means "palm huts" in Modern Standard Arabic. New fortifications were constructed at the original site by the Ottoman Empire in 1560. During the Napoleonic Wars, the French laid siege to the fort, which fell after 11 days on February 19, 1799. During World War I, the fort was destroyed by British bombers. It was later the location of the 45th Stationary Hospital which treated casualties of the Palestine campaign. The remains of those who died there were later moved to Kantara Cemetery. Theodor Herzl, the founder of Zionism, proposed Arish as a Jewish homeland since neither the Sultan nor the Kaiser supported settlement in Palestine. In 1903, Joseph Chamberlain, the British colonial secretary, agreed to consider Arish, and Herzl commissioned the lawyer David Lloyd George a charter draft, but his application was turned down once an expedition, led by Leopold Kessler had returned and submitted a detailed report to Herzl, which outlined a proposal to divert some of the Nile waters to the area for the purpose of settlement. El Arish Military Cemetery was built in 1919 marked the dead of the First World War. It was designed by Sir Robert Lorimer. On December 8, 1958, an air battle occurred between Egyptian and Israeli air forces over Arish. Arish was under military occupation by Israel briefly in 1956 and again from 1967 to 1979. It was returned to Egypt in 1979 after the signing of the Egypt–Israel Peace Treaty. On 24 November 2017, 305 people were killed in a bomb and gun attack at the al-Rawda mosque near Arish. Arish is in the northern Sinai Peninsula and is about 50 kilometres (31 mi) from the Rafah border crossing with the Gaza Strip. Arish is the closest larger settlement to Lake Bardawil. The city is served by el Arish International Airport. 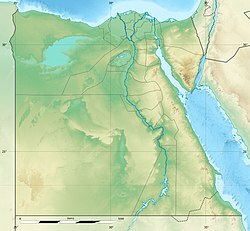 The construction of the northern coast highway in Egypt (North Sinai part) was expected to be finished by 2008 linking El-Qantarah at the Suez Canal in the west to the Gaza Strip border passing by Arish. The railway line from Cairo is also under re-construction and it recently reached the "Ser and Qawarir zone" west of Arish. This route was formerly part of the Palestine Railways built during World War I and World War II to connect Egypt with Turkey. The railway was cut during the formation of Israel. The North Sinai is a milestone for the Egyptian government planners to redistribute the high-density population in the Nile Delta, and it is expected that by accomplishing the transportation and irrigation projects, three million Egyptians will settle in North Sinai. Köppen-Geiger climate classification system classifies its climate as hot desert (BWh), although prevailing Mediterranean winds moderate its temperatures, typical to the rest of the northern coast of Egypt. The highest record temperature was 45 °C (113 °F), recorded on May 29, 2003, while the lowest record temperature was −6 °C (21 °F), recorded on January 8, 1994. ^ "Egypt mosque attack kills at least 184". BBC News. 2017-11-24. Retrieved 2017-11-24. ^ "Egypt mosque attack: Death toll rises to 235, state media says". Retrieved 24 November 2017. ^ "Al Arish, Egypt". Voodoo Skies. 13 August 2013. ^ "El Arish Climate Normals 1961–1990". National Oceanic and Atmospheric Administration. Retrieved June 25, 2015. ^ "El Arish, Egypt: Climate, Global Warming, and Daylight Charts and Data". Climate Charts. Retrieved 8 July 2013. 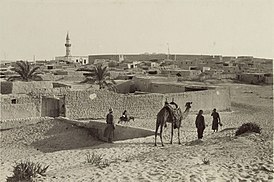 Wikimedia Commons has media related to Arish. This page was last edited on 29 January 2019, at 21:58 (UTC).